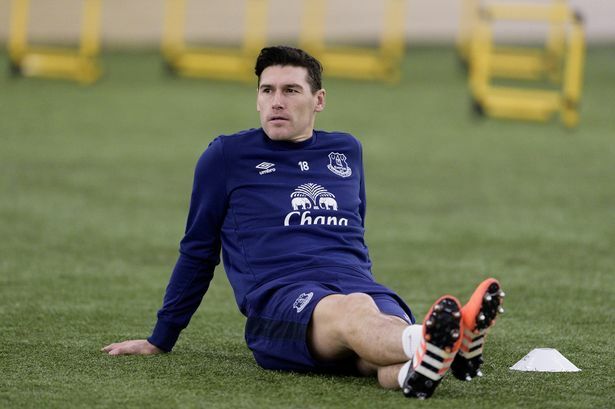 Everton midfielder Gareth Barry is of the opinion that Ross Barkley can one day become like the Steven Gerrard of Everton but he needs to come up with performances on a more consistent basis. Barkley is seen as one of the latest highly talented youngster from the famed Everton youth academy. Over the years, several top stars like Wayne Rooney have emerged from these stables. After having been linked with Chelsea and Manchester City in the last few years, Everton have been able to keepBarkley even without the European football. After recently undergoing a managerial change to bring Ronald Koeman to Goodison Park, the club has spent substantial amount of money in order to aim for European qualification on a regular basis. As a youngster,Barkley will know that he will have to face a lot of disappointments as he gains experience. One of the latest has come in the form of being left out of the England squad by manager Sam Allardyce. Even thoughBarkley has started the season in sparkling form, he has missed out on the squad announced by the new manager. Forcing his way into the new manager’s thoughts will be extremely difficult, but Barry reckons that it is possible with consistent performances. Steven Gerrard feels for the young English players, who, he says, are almost afraid right now because of heavy media scrutiny after a shameful show in France, but, he reckons it’s for the good of them as they would now be tougher personalities . The legend, who has only had about two years out of international Football, reckons having been through a bad experience once, a player would never desire to be through it again and thus he would labour as hard as possible so that it doesn’t get wrong next time for him. According to the Galaxy playmaker, like all the other people who live and breathe soccer in England, he was also optimistic and had not anticipated a knock-out at the hands of a team which had barely had any top drawer Footballer and that too before the quarter final. The quarter final was the lowest stage the previous skipper had foreseen the Three Lions making it to, but, not to be, causing much frustration to him as to the entire nation. The man in charge of the Liverpool senior team, Brendan Rodgers, reckons that his side can still achieve a lot in the ongoing season. The Reds have already been knocked out of the Capital One Cup and they are nowhere in the race for the Premier League title either. But, FA Cup and Europa League are the two competitions that they are still into and apart from that, they can push for the top 4 finish in the top flight too if they secure regular wins from here on in.